The Employee Free Choice Act is a bill that assures the protection of workers’ rights to unite in a union. This makes it harder for the management to manipulate or threaten the workers who are seeking to unite in a union. However, there is a constant opposition to this liberal reform. The Employee Free Choice Act also called as EFCA, enables the workers to choose a method to organize and form a union through a simple process. This method is in the form of a simple card sign-up process. Union memberships in the private corporate sectors have decreased from one-third to 8% during the decade. The Herculean task of creating and organizing a union has become easier due to the liberal reform of Employee Free Choice Act. Why does a union exist? What are the objectives of a union? Let us have a look at them. A labor union is a group of workers that forms together with a common objective. This group has a leader (also called as Pro-union activist) who bargains with the company owners on behalf of the working laborers. Either they come up with a group or a few elected workers appear at the meeting with management. The objective of the union is to collect and put forth the conditions for their betterment. The common goals are related to the working condition of the factory or organization, the safety standards of the machinery (as decided by the NTPC and regulation of employment and conditions of service Act 1996), increased wages and increased benefits of retirement term. The common goal includes objectives that secure the right of the workers. These goals include collective negotiations for the wages, working hours, the amount of workers assigned to the task (limited period task), etc. Further, they also demand the authority to stop the violation of the rules regarding the hiring, promotions, firing and complaint procedures. The complaint may include the unsafe condition of the workplace for which the organization should follow up soon. Corporations or the management has the power in their hands. They have the right to the opinion. However, they cleverly misuse their right and power during the election process. This clever step is a violation of the right to democracy. Democratic election process demands equal assets and power. However, corporatists have cunningly taken the control of the process. Their power enables them to manipulate the situation. A system that is corrupted may bring along many risks to each step. Similarly, in the intimidating and dominating influence of the employer into the union formation process, it is a real-time challenge for the workers. However, those workers who try to succeed in the challenge are met with 20 times higher odds of losing the job. According to the report surveyed in 2007 by the Center for Economic and Policy Research states that, during 30% of electing processes, at least one pro-union worker has been fired. Thus, the risk of losing the job always persists during the formation process. After the formation of a successful union, the next step is to proceed with the bargain of a common goal. The corporations often opt to bargain with the newly formed union in a bad faith. The employers use the delay tactics to stall the negotiation process. This makes the employees/workers frustrated with the process due to which they lose hope in justice. Moreover, if the management is unable to conclude in the first contract in the first year of formation then the union receives decertification. According to a report, not more than 38% of the certified union receives the first contract at the end of the first year. Moreover, only 56% only achieve the objectives of labor unions. Due to such loopholes that make it impossible for the workers to attain their right, the Employee Free Choice Act came into existence. The EFCA works in the favor of the workers of the factory. Unlike earlier, where 30% of signed cards by the employees resulted in the schedule of the meeting for the new collective bargaining among the management, the EFCA enables the union for workers with the majority of 50% signed cards to set the meeting of a labor union to meet the management for the bargaining agreements. Hence, no additional ballot is required for the process. According to Employee Free Choice Act, the employer should work on the negotiation with the union within the first 90 days of the collective bargaining agreement. However, if both the parties fail to settle down an agreement then the Federal Mediation and Conciliation Service (FMCS) are notified of the on-going dispute. If the mediation fails then the both the parties will be bonded to the arbitration board. The EFCA clearly makes the company or the organization liable at an unlawful dismissal of any employee. Moreover, the owner receives a penalty, which states that the employees (those who were dismissed unlawfully) will receive three times more than the usual payment. However, the penalty is not limited to the payment. The people of both the classes perceive the objectives of EFCA in various ways. Some people find the Employee Free Choice Act beneficial whereas others strongly oppose its existence. Let us have a look at the pros and cons of the EFCA. One of the pros to this act is that only 50% of the total workers sign a card for a labor union, it would qualify that union to be the representative of the employees during the meeting with the management for the collective bargaining agreement. Moreover, it simplifies the process for the workers to fight for their rights. Ease itself is the benefit for the workers. The condition of the workers is the biggest issue. 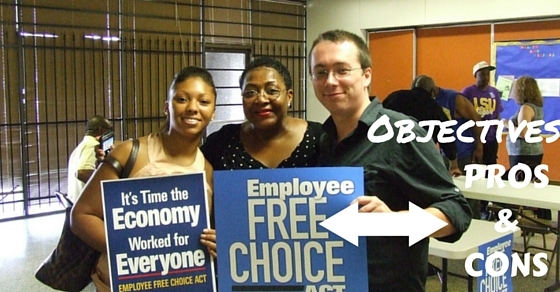 The Employee Free Choice Act is formulated to strengthen the union power. The ease to form something to protect the constitutional rights of workers is a huge benefit in itself. Moreover, the management has no right to intervene in the process. Previously the organizations used to apply the delay tactics after the formation of the union for the first contract. As a result, when the meeting fails to settle the objection in the first year of formation, the union is decertified. However, the EFCA limits the period in which the employer should take an action against the dispute. If the employer fails to do so, then the FMCS is requested to handle the matter. If necessary then the binding arbitrary is also availed. Thus, EFCA gives a guaranteed output to the workers. Moreover, it cuts the company’s dominance over the matter. At the end of the day, the employer is the supreme body, under whom the employees work. As a result, the employers can easily threaten the employees to get against the formation of the union or he or she may lose the job. The job is the main factor around which the entire thing revolves. Hence, employers have the ball in their court. However, with the Employee Free Choice Act summary, it is impossible for any organization, employer to threaten, or harass the employee in order to intervene, the progress of the union formation. Moreover, EFCA protects the rights of the worker as well as it penalizes the company for unlawful dismissal. It is the constitutional right of every citizen to be treated with dignity. The rights of the workers are also constitutional and the company must make sure to maintain it. Due to EFCA, the formation becomes easier and the process. Through EFCA, the workers are supported to protest against the unsafe and hazardous working condition. This also includes issues of underpayment, a number of employees for a term (in a particular task), timely bonuses, a proper access to health care, etc. This Act enables the worker to put forth their grievances or bring the issue to the court if needed. Moreover, the management faces no problems during the process as the work continues in a formal procedure. Employers have a pool of resources, which is the initial loophole of the union system. However, the EFCA eradicates the corrupt system from the route. It empowers the front line workers or pro-union activists to collect the required pool of resources. This enables them to form an appropriate campaign. Moreover, the job security policy enables the majority of the employees to join the campaign. As a result, the opportunity to form a strong body is enabled. There are an innumerable amount of benefits of the EFCA. However, to gain a perfect insight on the matter it is equally important to understand the cons of EFCA. The EFCA capacitates the worker to form a union based on a card system. Since they have the right, it is more likely for them to use the function in their favor. Unlike the secret ballot election, which could be delayed for a period, EFCA helps in scheduling a meeting anytime and anywhere. Moreover, the management has no right to intervene but is also held responsible for the action whereas the union is accountable for any action. It increases the possibilities of misusing the power at hand. EFCA is indeed a wish come true for the employees. However, the nature of this Act has no benefits for the employer. Moreover, it empowers the employees to form a union with ease and demand for union benefits and wages. This cuts the control of the employer over the company, as a result, the employer is unable to dismiss the illogical demands, which might affect capital of the company. Moreover, the employees have no right to choose as the union initiates the demand. Thus, the employees have no option but to joining a union. The formation of Employee Free Choice Act will make it hard for the company to fulfill all the demands. Thus, it increases the chances of the workers to go for a lawsuit against the company. Due to EFCA, the employer has no way out and will have to submit to the demand. This may have a huge impact on the capital of small industries. Moreover, it will affect the industry in many ways. Not all union is capable of representing the employees in a proper way. Some inefficient and ineffective unions may prove to be harmful. These unions may not even focus on the mass betterment of the workers. However, the EFCA may contribute in empowering such poor unions. More lawsuits and court activities may affect the usual working of the industry. This lessens the productivity by a huge number. Moreover, this degrades the reputation of the company as well. As a result, the investors may feel insecure about the invested company and may take their hand back. Lack of investors can reduce the businesses as well as debase the economy of the country. There are many employee free choice act pros and cons. However, it is important to look at the matter in a subjective manner. Opposition party from the business sector supports the help that EFCA provides to the workers. However, the bane of the Act should not be ignored entirely. Moreover, the contribution of EFCA should be considered carefully.